Farro Salad with Kale and Butternut Squash. A Yummy Side Dish! This dish is so yummy! The butternut squash and the kale help bring out the nuttiness of the farro. If you’re looking for a healthy or creative new side dish to add to your weeknight dinners, look no further than this farro salad. Kale is a leafy green with tons of vitamins. You can’t go wrong with kale! Butternut squash also had great vitamins like beta carotene. But let’s talk about farro. 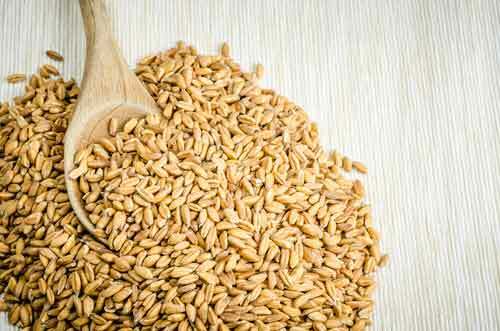 Farro comes from the grains of wheat, so be careful if you’re following a gluten-free diet. Farro is not gluten-free! You make it similarly like rice; boil the water, add the farro, reduce to low and let simmer for 18-20 minutes. It should be soft but still almost crunchy. One serving of farro has 7 grams of fiber (that’s 28% of your daily value!) and also has 7 grams of protein! Farro makes for a perfect side dish but can also be a great replacement for rice. This is a creative and tasty farro salad. Try this out at your next dinner party or just to switch up your weeknight sides! This is a great side dish! The flavors of the kale and butternut squash bring out the delicious nuttiness of the farro. In a medium saucepan, pour two cups of vegetable stock with farro. Bring to a boil and then reduce to low. Cover and cook for 45-60 minutes, longer for softer farro and shorter for more chew. While the farro cooks, melt the butter and cook the onions over medium-high heat. Stir occasionally and brown them just a little. 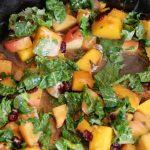 Add the squash, apple, and sage into the skillet. Saute for 3-4 minutes. Add the last cup of stock and cook until the squash can be easily pierced with a fork, but not mushy. You want it to hold its shape in the dish. Remove from heat and serve immediately with Romano sprinkled over the top. Enjoy!